Gcina Mhlophe is returning to Europe this September and June 2014 to share with us her fascinating stories, chants, peoms about old legends, modern myths and everything else that comes to her mind. Part-time news reading for the Press trust, BBC Radio, Africa service, ZBC, etc. 1985 and 87 – 89 Writing and acting in the autobiographical piece “Have you seen Zandile?”, touring South Africa, Lesotho, most of Europe – participating at the Edinburgh festival. Mounting the piece as a Visiting Director at the “Chicago Theatre Co.” and at “Knoxville’s Carpet Bag Theatre” in Tennessee with different US. actors, who later went touring USA. 1986 Acting in the workshop play “Born In The RSA”, directed by Barney Simon, touring South Africa, England, most of Europe and the US. Participation at the Edinburgh festival. 1987 Visiting assistant director with Barney Simon at Boston’s “Brandeis University, workshopping and staging the musical play “Written By Hand”. 1989/90 Resident Director at the “Market Theatre” of Johannesburg. Co-writing and singing in the musical “Inyanga”, directed by Barney Simon. Writing and directing “Somdaka, touring Johannesburg’s Townships, and Zimbabwe. 1998 Nine part storytelling TV series“Gcina and Friends“ for SABC, produced by Endemol, sponsored by JOKO, Unilever. 1988 Performing poetry in a one woman show during the international “Women’s Project Festival”, New York. 1995 Creating and performing stories for the London Royal Academy Of Arts in connection with the “Africa 95” festival exhibition. 1998 Participated in an intensive musical workshop in Senegal’s Goree Island at the Goree Institute , with many African musicians from different African countries . 1999 Was one of the top performers at the GRAZ International Storytelling Festival in Austria . 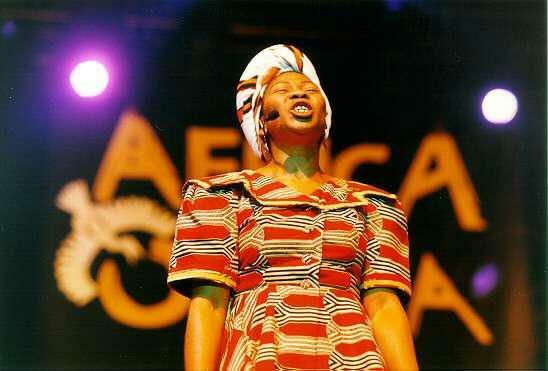 1999 M. C. and performer at the Wuerzburg Africa Festival in Germany, the focus country was South Africa. 2000 Recorded new series of Radio Storytelling programmes for 1. UMHLOBO WENENE Radio ( Xhosa ) and UKHOZI Fm ( Zulu ) both sponsored by the JOKO Storytelling Project . with musicians Pops Mohamed and Bheki Khoza. 2001 and 2002 Nozincwadi Litracy Campagne – touring rural areas in South Africa. Promoting the importance of reading and starting school library boxes. 2006 Gcina represented South Africa at the FIFA WORLD CUP in Germany and performed at the SAfrican World Cup Logo Reveal, a performance that was broadcast to billions of Television viewer around the world. 2009 Gcina travelled to Germany and Greenland to perform with an all woman cast “HOUSE OF SONG & HOPE” she wrote the script and music. Same year she stayed on and created a new Workshop Theatre Piece with Greenlandic performers, a TRAVELLING SONG, a partnership that will be performed at the Vancouver Arctic Winter Games in March 2010. In all she does, Gcina continues to fly South Africa’s flag with pride. 2011, Singapore, Hosted by the National Museum as part of the CONGO Mask Exhibition. 2011, Book, ‘AFRICAN TALES” with Barefoot Publishers also came out in Portugues and Japanese.